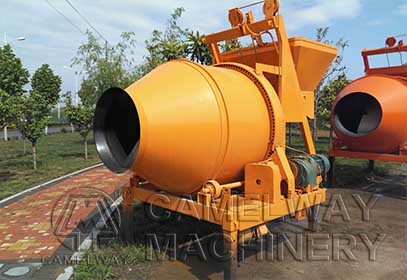 The concrete drum mixer is also called reversible concrete mixer, which is a self-falling double conical mixer machine. Self-reversing concrete drum mixer includes JZM and JZC series concrete mixers. The drum of JZC concrete mixer is driven by gear, while JZM type is driven by friction wheel. The drum concrete mixer has a unique characteristic, positive turn for mixing and reverse turn for discharging automatically. As a professional manufacturer and supplier of concrete mixer, Zhengzhou CamelWay Machinery ensures cement drum mixer has good reliability and high quality. Until now, rotating drum mixers have been exported to many foreign countries and are welcomed by foreign customers.